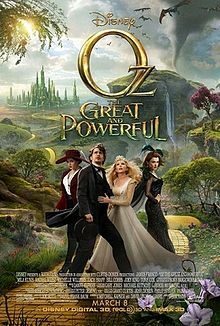 Just got back from taking my granddaughter to see OZ the Great and Powerful. It was a good movie, if not a little intense at times. Alivia is six and before the movie was over she'd moved to the seat next to me (there was an empty one between us for snacks and stuff) and was clutching my hand. I even jumped a couple times. The acting and special effects were very good and it started out in black and white like Wizard of Oz. No singing though.